Boasting equal parts scholarship and style, "All Governments Lie" is a highly readable, groundbreaking, and timely look at I. F. Stone -- one of America's most independent and revered journalists, whose work carries the same immediacy it did almost a half century ago, highlighting the ever-present need for dissenting voices. In the world of Washington political journalism, notorious for trading independence for access, I. F. "Izzy" Stone was so unique as to be a genuine wonder. Always skeptical -- "All governments lie, but disaster lies in wait for countries whose officials smoke the same hashish they give out," he memorably quipped -- Stone was ahead of the pack on the most pivotal twentieth-century trends: the rise of Hitler and Fascism, disastrous Cold War foreign policies, covert actions of the FBI and CIA, the greatness of the Civil Rights movement, the horror of Vietnam, the strengths and weaknesses of the antiwar movement, the disgrace of Iran-contra, and the class greed of Reaganomics. His constant barrage against J. Edgar Hoover earned him close monitoring by the FBI from the Great Depression through the Vietnam War, and even an investigation for espionage during the fifties. After making his mark on feisty New York dailies and in The Nation -- scoring such scoops as the discovery of American cartels doing business with Nazi Germany -- Stone became unemployable during the dark days of McCarthyism. Out of desperation he started his four-page I. F. Stone's Weekly, which ran from 1953 to 1971. The first journalist to label the Gulf of Tonkin affair a sham excuse to escalate the Vietnam War, Stone garnered worldwide fans, was read in the corridors of power, and became wealthy. Later, the "world's oldest living freshman" learned Greek to write his bestseller The Trial of Socrates. Here, for the first time, acclaimed journalist and author Myra MacPherson brings the legendary Stone into sharp focus. Rooted in fifteen years of research, this monumental biography includes information from newly declassified international documents and Stone's unpublished five-thousand-page FBI file, as well as personal interviews with Stone and his wife, Esther; with famed modern thinkers; and with the best of today's journalists. It illuminates the vast sweep of turbulent twentieth-century history as well as Stone's complex and colorful life. The result is more than a masterful portrait of a remarkable character; it's a far-reaching assessment of journalism and its role in our culture. "I loved every page of this book. My God, what fabulous stories -- newspaper stories, political stories, world history, and the greatest tabloid there ever was, all crammed into one life. And above all, what a hero -- indomitable, learned, funny, and fearless. I learned more stuff I didn't know -- that Izzy Stone solved the murder of George Polk, that when his paper told him he couldn't cover the execution of Sacco and Vanzetti, he quit and hitchhiked to Boston. What a combination of integrity and learning. He really did have a wonderful time. Now is the time for all good journalists to read this book and remember what it is all about." "'All Governments Lie' strikes me as the right book at the right time. It is not only the fascinating story of an American original, it is also a sophisticated history of what went wrong between American journalism and American government." Myra MacPherson is a brilliant writer who has written a great book about a journalistic idol -- Izzy Stone. Would that he were alive today to lead our country to its greatest ideals again." -- Helen Thomas, Hearst newspapers columnist and author of Watchdogs of Democracy? "Izzy Stone comes as close to living up to the rhetoric of free speech and a free press as anyone in the twentieth century. His story is told here in the rich historical context of his time. This book is an important contribution to the current debate about the future and the nature of journalism and why the public as well as journalists should be involved in that debate." "Thanks to Myra MacPherson, we finally have a nuanced and sophisticated biography of one of the great legends of American journalism. 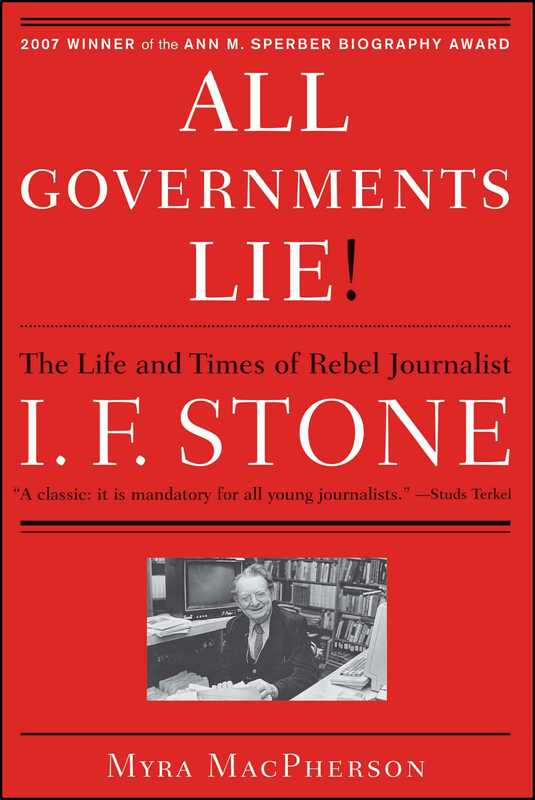 One can only hope that it wakes up some of the lapdog reporters in today's Washington press corps and reminds them, as I. F. Stone taught us during the Cold War, that 'all governments lie.'" "Where is Izzy Stone when we need him? His spirit is back in 'All Governments Lie,' a powerful, passionate biography of the courageous writer who defied Official Washington and inspired several generations of journalists. 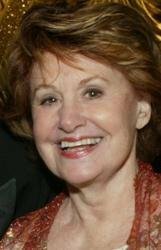 Myra MacPherson, a pioneer in the art of cutting-edge profiles, is brilliant in evoking his life and times." "Stone remains enormously relevant today, in an era of too much journalistic acquiescence. A newspaperman for decades, he became 'an eclectic craftsman,' with a reformist and intellectual bent.... 'Izzy,' as he was called, emerges as a challenging, complex fellow, an ebullient workaholic. But his legacy was earned by a willingness to read documents in depth and apply his eclectic, passionate intelligence -- and MacPherson brings all this to life in this terrific and timely book." "At last! Myra MacPherson has offered us the definitive life and times of the most independent journalist of our epoch -- I. F. Stone. Known as Izzy, he revealed to us in his tiny four-page weekly not the 'objectivity' of the Official Word but a hard truth from the bottom up. This book may become a classic: it is mandatory for all young journalists." Book Cover Image (jpg): "All Governments Lie"